On November 7, 1908, the three members of the Examining Board of Engineers and Architects, by secret ballot, recommended to the Governor Sir Harry Fane Grant that a man who had never attended a formal course in architecture, should be granted the Warrant of Land Surveyor and Architecture without the need to sit for any examination. This action was so unusual that it promptly and predictably generated a strong condemnation from the Institute of Architects. The official response was that in 1892, the man in question had been admitted to the Institute of British Civil Engineers and that in 1907 he was recognised as an architect by the Royal Institute of British Architects. This man, Andrea Vassallo, was born in Luqa on January 2, 1856. He was the son of Salvatore Vassallo, a stone mason, and Catherine née Sammut. He had three other siblings: Joseph, ordained priest on December 21, 1878; Carmel, ordained priest on December 18, 1886, and John, known as ll-Bennej tal-Ortografija Maltija (the Builder of Maltese Orthography). Andrea began his career as a stone sculptor and spent the first 11 years of his professional life in private practice. In 1877, Vassallo prepared a design for the statue of St Andrew, together with its pedestal, which still stands today in Carmel Street, Luqa. He also undertook the sculptural ornamentation on the said pedestal. In 1883, when Sir Arthur Borton was Governor of Malta, the Ball Memorial Restoration Fund was set up to collect funds for the restoration on the monument to Sir Alexander Ball at the Lower Barrakka, in Valletta, which was in a thoroughly dilapidated state owing to it being exposed to various elements. Vassallo, under the supervision of architect Emmanuel Luigi Galizia, was entrusted with the task of its restoration, almost its rebuilding. 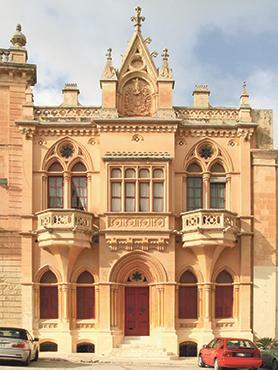 Vassallo’s first great work was Princess Melita Theatre, Sliema, in 1885. “A beautiful and striking design which demonstrates the ability of Andrea Vassallo – indeed a perfect oeuvre,” wrote someone in the newspaper Malta. On December 21, 1887, having already demonstrated his abilities in architecture, he was appointed Clerk of Works at the Department of Public Works. In this post, which he held for three years, he was responsible, among other works, for the building of St Vincent de Paul Hospital at l-Imgieret, Luqa, and the Ħamrun and Sliema schools. 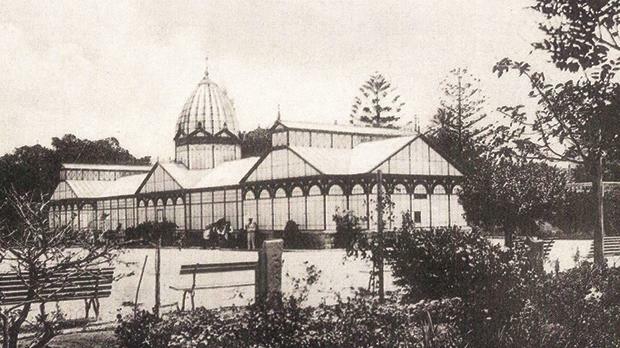 Moreover, he designed and set the wrought-iron conservatory at Argotti Gardens, Floriana. It was an innovative form of ironwork for Malta. While photographs showing this ambitious task still exist, it is unfortunate that the structure itself was dismantled because the cost of its maintenance was deemed too high. 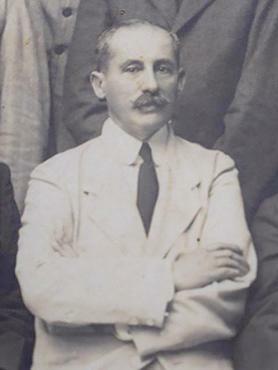 In June 1908, Vassallo attended, at the invitation of the British Institute, the Eighth International Congress of Architects in Vienna. His friends included some of the best European architects of his time, including Ernesto Basile, Marcello Piacentini, Thomas Simpson, Leonard Stokes and Alexander Davidson. Many were the foreign architecture magazines who invited him to publish his works and writing. The enlargement and almost total reconstruction of Stella Maris parish church, Sliema, was also done under his direction. 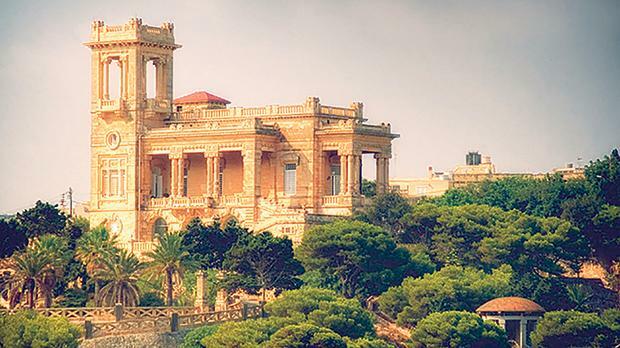 Several works in Villa Bologna, Attard, were entrusted to him by Lord Strickland. He designed and oversaw the construction of villas in the Early English style for Judge Pasquale Mifsud and Baron Igino Depiro in Saqqajja, Rabat. The house built next to the Mdina Cathedral was also built following plans by Vassallo. This house, built in Neo Gothic, seemed to somehow taint his reputation for his skill in harmonising a design with the surroundings. Indeed, this thought was more than redeemed by his other works. It seems that Vassallo had many British patrons. Colonel Woodward entrusted him with the design for a Soldiers’ and Sailors’ Institute. General Hales Wilkie, who on January 1, 1888, became Commander of the Infantry Brigade in Malta, asked him to prepare a design for the Branch Union Club in Sliema. 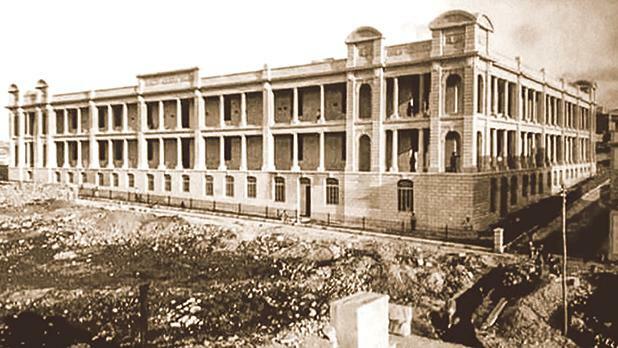 The house of the Little Sisters of the Poor, Ħamrun, and Zammit Clapp Hospital, Gżira, were built following his instructions and designs respectively. When, on May 17, 1912, Archbishop Peter Pace formed the executive committee for the organisation of the International Eucharistic Congress, which was to be held in Malta in April 1913, Vassallo was appointed member and chairman of the subcommittee for street decorations. Vassallo received wide approval on October 3, 1912, when he presented his drawings to the executive committee members. All were astonished with his numerous and pioneering ideas. Among other works, he designed the triumphal arch that was set up at the entrance to Valletta. Moreover, the canopy raised outside the Mall, Floriana, was utterly outstanding. Mgr Heylen Thomas, Bishop of Namur in Belgium, and Secretary of the Standing Committee to organise Eucharistic Congresses, remarked that these embellishments were truly unique. Vassallo’s prestige was further enhanced when, on November 17, 1913, he was decorated by Pope Pius X with the insignia of the Order of St Gregory the Great, Civil Class, in recognition of the services he had rendered during the congress. Three years later, on December 30, 1917, Malta again recalled the congress by inaugurating the monument of Christ the King, in Floriana. On that day, the Maltese gathered around and saw the figure of Christ being worshipped by Malta (represented by an allegorical figure), a real and living witness of what had happened throughout the days of the congress. Vassallo was among other renowned Maltese artists and architects who formed part of the committee in charge of setting up this lasting monument. Vassallo turned eclecticism into a vibrant aesthetic virtue, designing in different period styles with the same ease. He also designed two Art Nouveau houses which were built in the 1920s: the Casa Said, on the Sliema front (which has regrettably been demolished), and Villa Rosa, in St Julian’s. On January 3, 1921, Pope Benedict XV signed the decree by which Senglea’s collegiate church was raised to the dignity of basilica. Although time was short, given that the solemn coronation of the statue of the Nativity of Our Lady (Maria Bambina) was to take place on September 4 of that same year, works to erect a fixed baldacchino instead of the high altar started immediately. It was around February when Vassallo completed the designs for the erection of the baldacchino. On May 27, the main altar was dismantled and works on the new canopy were initiated with the first stone being laid on June 12. All was in place by August 26, 1921. 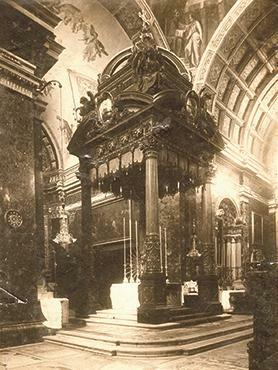 The baldacchino, erected in 1921, on the high altar of Senglea Basilica. In 1923, Vassallo won a contest with the design he prepared for the dome and bell towers for St Cajetan’s church, Ħamrun. However, it was only in 1953-55 that the dome was constructed under the direction of architect Chev. Joseph D’Amato who, while preparing all the working drawings and structural designs, faithfully followed those made by Vassallo. The Ħamrun dome, designed by Vassallo to blend in medieval elements to match the style of the church, is one of the most beautiful domes in Malta. The majestic dome of St Nicholas parish church in Siġġiewi, also engineered and designed by Vassallo, leans more towards a classical style. It is interesting to point out that these two domes are both bivalve, an idea which was totally new for Malta in the design of domes. The shape of the outer part was designed on the so-called catenary curve, intended to withstand much more weight than the spherical shape that is the norm for Maltese domes. Vassallo was also in charge of the construction of the Rococo-style church dedicated to the Nativity of Our Lady, known as Tal-Ħerba, Birkirkara and other works in it. 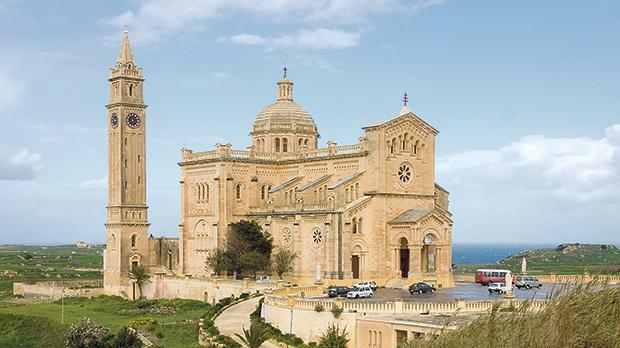 Vassallo’s final work was the basilica dedicated to the Assumption of Our Lady, known as Ta’ Pinu, in Għarb, built on the Neo Lombardo-Romanesque style, justly admired for the beauty of its lace-like stone carving. The plan of this sanctuary, indeed remarkable for its accuracy in proportion and symmetry, and for its indoor and outdoor sculptural works, was displayed in April 1919. A year later, on May 30, 1920, the first stone of the church was laid. Sadly, Vassallo did not live to see this project completed. Hence, this national and monumental sanctuary remains a silent, living tribute to the ingeniousness of its Luqa-born architect. Andrea Vassallo died at the Blue Sisters Hospital (today Zammit Clapp Hospital) on January 21, 1928, and his mortal remains were laid to rest at Santa Maria Addolorata Cemetery. Understandably, Vassallo was reticent about his private practice during his period in government service and he preferred to conceal his authorship of certain works during this time. Therefore, it is believed there may still be some of his works yet to be discovered. It was in this period that Vassallo reached his maturity, produced his major works, and was at his most prolific, so it is quite possible that there might be other oeuvres designed by him. Like many successful architects, Vassallo’s output was considerable, and, as one might expect, the quality of his designs tended to vary. He was more convincing when he was building in the Art Nouveau style or in the more genial Baroque-classic style. One cannot but admire Vassallo’s success in his ability to interlace medieval with classical elements. He was among the best in his profession and deserves a secure niche in Maltese architecture.